If you're planning to propose to the special man in your life or if you want to commemorate your engagement with a piece of jewelry for him, there are a number of men's engagement rings to choose from. It's easy to get overwhelmed with all the options but with a few pointers, you can pick the perfect ring for the perfect guy. You can buy engagement rings for men online and in local stores. If you're looking for a specific style, you may find a better selection online. Typically these rings are marketed as wedding bands though they often feature a larger center stone or accent. The following retailers offer masculine styles that are sure to please. As the name implies, Just Men's Rings specializes in all kinds of rings for men. There's a section devoted specifically to engagement rings, but many of the other options will work beautifully as well. Just Men's Rings has an easy-to-navigate storefront and a helpful 30-day guarantee for most items. Most rings come with free shipping and rush shipping is available for a charge. Reviewers on TheKnot.com give this store five stars, citing great prices and an impressive selection. Diamond Band with Satin Finish - This beautiful ring features a single round diamond set in a brushed-finish, 14k yellow gold band. It comes in sizes seven through 15 and retails for just over $500. 950 Platinum Black Diamond Eternity Band - A continuous line of 36 black diamonds add masculine sparkle to this simple, brushed-finish platinum band. It comes in sizes seven through 14 and retails for just under $2,700. One of the ultimate sources for women's engagement rings, Tiffany & Co. is also a good place to find a ring for the man in your life. This is a great shopping choice if you're looking for something for a brand-conscious man who loves fine jewelry. You can exchange most non-engraved rings within 30 days of purchase, and a full refund is available upon request. Shipping is free for some items, although it can cost about $15 for standard ground shipping on some orders. If you choose to shop in person at their flagship store in New York City, reviewers at TripAdvisor are impressed by the customer service, the atmosphere of the store, and the amazing selection. Paloma's Caliper Ring - This stunning design features a stainless steel band with a black titanium ribbon. The masculine ring is perfect for a guy with classic, but modern, taste. It comes in sizes 9 through 13 and retails for about $425. Paloma Picasso Knot Ring - Ask him to tie the knot with this simple and beautiful knot ring. Crafted in sterling silver, this classic design is eye-catching without being flashy. It comes in sizes seven through 13 and retails for about $300. If you're looking for a design as unique as he is, John Hardy is a great place to shop. With a number of exciting motifs that you won't see at other retailers, this is an excellent place to shop for a guy who is playful and one-of-a-kind. It's important to note that many of the rings at this site are made-to-order and can take up to 6- 10 weeks to be delivered. Additionally, they cannot be returned because of the custom nature of this jewelry. TripAdvisor reviewers who visited the John Hardy workshop in Bali praised the craftsmanship and incredible selection of pieces. 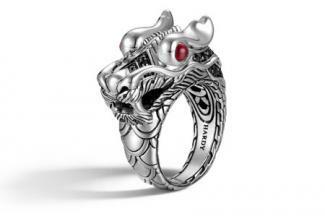 Naga Dragon Head Ring - This incredible sterling silver design features a fierce dragon head with ruby eyes and black sapphire accents. The ring shank is engraved with dragon scales. It comes in sizes nine through 14 and retails for about $820. Classic Chain Knot Ring - Featuring a cushion-cut gem seemingly held in place by crossed chains, this sterling silver ring is another stunning and powerful option. You can choose from two different gems: blue pietersite or sonora sunset. It comes in sizes nine through 13 and retails for just under $500. 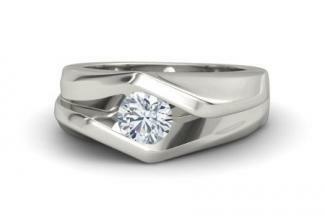 Gemvara offers a number of beautiful men's rings that would work to commemorate your engagement. You can create a custom design by selecting your choice of gemstones and precious metal. This retailer offers free shipping on all orders, and you can return your item for a full refund within the first 101 days you own it. Gemvara is accredited by the Better Business Bureau and has a rating of A+. Double-Edged Ring - This spectacular design features a one-carat, round diamond set in a chunky 14k white gold band with edge detailing. You can choose different gems and metals based on your preferences and budget, but the diamond and 14k white gold combo retails for about $4,800. It comes in sizes eight through 14. Octagon Ring - A more elaborate two-toned option with gorgeous filigree, the Octagon Ring makes a great choice for a guy who likes a ring that will turn heads. It can be customized as you choose, but you can get it featuring a 0.62-carat blue sapphire and small accent aquamarines set in sterling silver and 14k yellow gold for about $1,700. It is available in sizes eight through 14. For a truly one-of-a-kind ring, you can buy one made by a professional jewelry artist. Etsy has a number of lovely, unique options. Each shop has its own policies, so it's a good idea to review the details before committing to a purchase. Gilleri Jewel - Here, you'll find amazing designs mixing sterling silver and copper. Many of the rings have artful riveting. Prices range from about $200 to about $450. This seller has more than 75 five-star reviews. LivelyHood - This shop, owned by artist Tonya McMillan, has a wonderful array of chunky gemstone and mokume gane rings that would be wonderful options for a special man. Most prices are in the $100-$200 range. The store has over 275 five-star reviews. Like any major purchase, men's rings can vary significantly in price. You can find a beautiful ring for as little as $200 or $300 if you choose a simple design. On the other hand, if you're interested in a men's ring with diamonds, other precious gems, or a designer brand name, you can easily spend thousands of dollars. The easiest way to make sure you spend the right amount is to set your budget before you begin shopping. There's no right or wrong amount to spend on a ring as long as you don't spend more than you can afford. The old rule of "three month's salary" isn't practical for everyone. Set a budget that makes you comfortable, and you'll find a ring you love that doesn't exceed your means. Rings come in all shapes and styles, and chances are that some are more suited to your special guy than others. Think about what he wears on a regular basis. Does he dress mostly in t-shirts and jeans? If he does, a flashy diamond ring may not be to his liking. Similarly, if he wears a suit every day, a funky style might not fit with his personal taste. In addition, if he works with his hands or plays sports, a simple ring is probably a better choice than an elaborate design or ring with stones. That way, the stone or other embellishments won't catch on clothing and equipment. The perfect engagement ring will be different for every guy. Ultimately, you'll need to compare the options that fit within your budget to the style and taste of your special man. This type of careful consideration is what makes a difference between a ring that is just okay and a ring that will show him you want to be with him for the rest of your life. 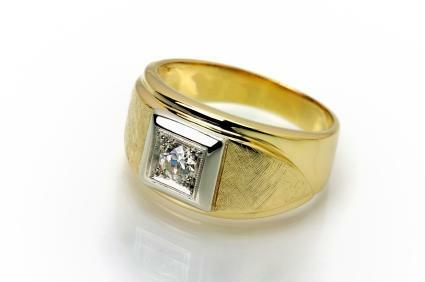 Today, many men wear engagement rings, and finding the perfect ring is all about knowing your special guy. Ultimately, the purpose of a man's engagement ring is to declare your love and commitment to one another.